José Paulo Bezerra Maciel Júnior—or just Paulinho to you and me—has split opinion since his move to Tottenham Hotspur from Corinthians in the summer of 2013. To some, he’s been a midfield maestro, imbued with the potential to one-day lead from the centre of the park in a similar manner to Lampard and Gerrard; players who Spurs fans have long held a silent, begrudging admiration for. To others, he’s looked to be an overrated and positionally indisciplined sort of luxury player whose performance level haven’t yet lived up to his billing or transfer fee. In the era of YouTube compilations and in-the-know idiot Twitter savants, most fans tend to have more than a passing clue about even the most left-field signings linked with their clubs. Similarly, few were oblivious when it came to Paulinho’s qualities within the Spurs faithful when he became the latest highly-rated name to swell Andre Villas-Boas’ squad. The midfielder didn’t win the Bronze Ball at the 2013 Confederations Cup for exuberant displays of tricks and flicks, or for an array of dazzling free kicks and wonder goals (although he has scored a few in his time). It was his battling, box-to-box persona through the middle of the park that caught the eye. At long last, it looked as though the midfield all-rounder that had been missing at White Hart Lane for so long had been found. It’s no secret that Spurs’ currently boast an embarrassment of riches in central positions, with the sheer number of midfielders on the books alone now dwarfing the tally of playing positions available. Yet it can be argued that most of the midfielders on Tottenham’s roster at present are rather specialised and precise in their roles; tooled up to perform a specific job very well. When one thinks of Brazilian football, the most immediate stereotypes that spring to mind are their endless conveyor belt of samba-inflected step-over prodigies; Pele; ‘that’ Carlos Alberto goal; players with one name nicknames; and a footballing identity fusing together a blend of exotic mystique, organic technique and a contradictory mix-up of light-heartedness and a serious desire to win. Their players have charisma on the ball, class and a natural excitement that oozes out every pore of their showboating, leather boots. At least, these are the clichés. In Paulinho however, Tottenham have added a hard-working, well-rounded footballer who should—in theory—be the key man to allow more creative players to do their jobs. On paper, he provides the link between the different passages of play and specialists within the squad. Given Sandro’s now established presence at the Lane, it would seem that Tottenham are getting used to signing Brazilians with a work ethic rather than an all-consuming tendency towards exhibitionism. True to form, Paulinho hit the ground running. Perhaps benefitting from the fact he was one of the first pre-season signings made under Villas-Boas, and therefore able to train with the team a lot more than other new arrivals, he appeared at once familiar and at home with his new club. Not that this should be such a surprising attribute from a player who joined a club in Lithuania in order to make his breakthrough aged just 16, having found chances limited in Brazil. Paulinho even found himself moving to Poland before going back to climb the ladder in Brazil, making his debut in the full national side in 2011. He is a player well adjusted to finding his place amid new surroundings and the cultural challenges that come with moving to a foreign land. In contrast to the likes of say, Erik Lamela, it would be easy for Spurs fans to paint his introduction to the Premier League as a resounding success and simply leave it as that. Why then, has his season felt vividly underwhelming? Having been one of the most used players by Villas-Boas it would be easy to argue that exhaustion has played its part in his performances. As one of the key elements of Brazil’s Confederations Cup win, Paulinho has certainly had less of a break than others in the side, and this has led to some of his performances looking more than a little ‘leggy’. Whether a victim of the reliance his former coach placed on him early on or not, he was a vital if unspectacular midfielder within the Portuguese’s favoured set up. Yet there was also a distinct air of him being ‘one of those players’ at times, with various fans and pundits declaring themselves either unimpressed or completely enamoured with the way he went about making an impression on English football. Plugging away at opponents and providing some much-needed, rugged movement from box-to-box—finding space, making tackles and charging up and down the field—are celebrated qualities on these shores, and yet still seen as distinctly ‘un-Brazilian’. When it comes to judging him by the usual styling of his compatriots, some have failed to see the what all the fuss is about. This phenomenon isn’t restricted to Tottenham fans or Anglicised football supporters, however. Conversations with Brazilian friends have revealed the same bewilderment on their side of the Atlantic as well. Such was the media buzz over Paulinho after his Confederations Cup performances and high-profile switch to the hype and bombast of the Premier League that Spurs games started to be picked for broadcast in Brazil ahead of fixtures featuring rather more show-pony-like Brazilians. “Most overrated Brazilian at the moment” was one particular phrase that stood out as rather harsh, but there does seem to be an air about him and a style to his play that romantics may instinctively reject. It should come across as faintly ironic then that two of his best moments this season have come when he has ‘hit the samba button’, so to speak. A backheeled winner in added time against Cardiff was so euphoric in its timing and impact that the nature of the goal, and the silky way he got the ball in the net, was almost overlooked. It would seem that even hard-working midfielders in Brazil don’t just bundle the ball across the goalline. Against Stoke City he seemed hell bent on packing as many flicks and crafty passes into his game as possible. 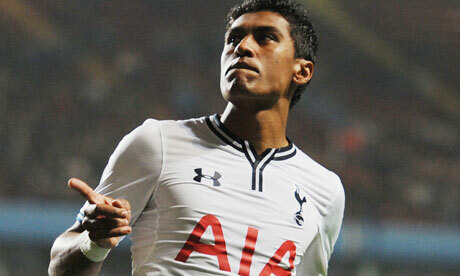 It was perhaps Paulinho’s best performance of the season in a Spurs shirt. We’d seen him do these in a match before of course, but rarely with this much impact or success. A backheeled flick over two defenders into the path of Roberto Soldado was sublime; a nicked through ball to an advancing Eriksen caught even the talented Dane flat-footed such was its unexpected accuracy. His double sombrero later on was just showing off. “So he is Brazilian, after all”, seemed to be the go-to reaction for many of those who hadn’t been convinced by his earlier outings. Admittedly, this was against Stoke at home, a fixture that Spurs would normally be expected to win, but such was the desire and ability on the ball shown by Paulinho that day, his departure due to a savage Charlie Adam hack—which put him out for four weeks—was treated as a tragedy twice as regrettable than it otherwise would have been after his card against Liverpool. From zero to hero in the space of an enforced suspension. The fact that his best game came about after a break in the endless week in, week out spamming of matches that he was expected to surge through was no coincidence either. Now, I’m no statistician but for what its worth, I like Paulinho. The prospect of him and Sandro maturing together in the centre of the Tottenham midfield excites me a lot. His box-to-box characteristics, hard-working nature, and eagerness to get forward will in my opinion make him a key player for Tottenham for years to come. He’s had an up and down season so far, yes, but should Spurs ever obtain stability I can see him developing into a mightily impressive midfielder. Paulinho wears the number 8 jersey for Spurs, a number once so proudly worn by the likes of Jermaine Jenas. If he delivers us a season the likes of which the now-QPR midfielder once threatened to pull off—all topped off with a sprinkling of Brazilian samba flair—then I will be a very happy man indeed. This entry was posted in The Samba Series and tagged paulinho, samba series, tottenham hotspur by The Samba Series. Bookmark the permalink. paulinho didn’t have much training when he arrived at spurs. same as soldado as both players were in the confederations cup and went all the way to the finals and then took one or two weeks off to rest before they went to spurs and played only one friendly game against espanyol. Then add the fact that the rest of the buys except chadli were bought later then i’m not surprised spurs struggled as much as they did. 7 buys with no EPL experience. That was a disaster waiting to happen. Anyways since they have this year’s experience and with pochettino coming to spurs, i expect them to be challenging for the title next year if they don’t sell anyone.